As a merger and acquisition advisor focused on the clinical documentation and revenue cycle management spaces, I speak often with those business owners and executives. A recent topic of discussion has been the disruption to the coding industry caused by the transition to ICD-10. The consensus is that it was similar to Y2K when business built to a crescendo and then tapered off fairly quickly. At the peak of the ICD-10 transition crescendo, health care service providers were dual coding, coders were learning ICD-10, demand for coding services was high, prices for those services were escalating, and there was a shortage of experienced coders. Business had never been better. And then, boom—the crescendo passed. Dual coding rapidly declined, coders had been retrained, demand for services declined, and there were plenty of coders available to do the work. Now that nearly two years have passed since the ICD-10 transition date, what does the future hold for the coding industry? Ignore the "bump" caused by the transition itself. Although ICD-10 is real and will have a huge impact on the industry's future, the transition itself was a one-time event. It created an economic jolt and artificial demand for resources, but the event is behind us and will have no additional impact on future resource demand surges. It makes sense to look at the future from three perspectives: the industry as a whole, the industry as a business opportunity, and the industry as a source of employment for coders. It's difficult to imagine the health care system without coding. As overwhelmingly complicated as our medical reimbursement process is, coding is a pretty efficient way to transfer the enormous volumes of information necessary to justify reimbursement. In addition, assigning medical codes creates troves of detail-rich data that can be used for research, analysis, and treatment. In short, coding creates good and valuable data. Moreover, the population is aging and growing, forcing the health care industry, including coding, to expand. It's hard to imagine the industry experiencing a paradigm shift or industry disrupter resulting in the elimination of coding. In fact, the coding industry will continue to grow as health care reimbursement and care models evolve. An increase in accountable care organizations with a transition to payment based on capitated rates for discrete patient populations is foreseeable. Not only will this significantly change the practice of health care, it also will have a profound impact on reimbursement and billing. Utilizing the logic behind the implementation of ICD-10, specifications of a patient's history and chronic conditions will become even more critical to create predictable care and cost models. Capitated rates must be based on a population's experience, which must be recorded, measured, and analyzed. Again, given the enormous volumes of disparate medical information that exist, the only way to accomplish this is to create organized data. That's where coding comes in. The importance and value of data in a digital world cannot be overestimated. For example, a recent Wall Street Journal article suggested Amazon bought Whole Foods in part to obtain data about in-store shoppers. Without coding, the enormous amounts of health information collected are meaningless. It would be similar to sorting through a bucket of sand to find a grain of gold. It's there, but impractical to find. Coding organizes and makes sense out of all those data. If there will always be a need for medical coding, it makes sense that it would be a sound business investment. As mentioned, the medical reimbursement process is incredibly complex. It is also time consuming and expensive. Businesses that can simplify, accelerate, and lower the cost (or add additional value at the same cost) of medical reimbursement will be successful. The cost of billing a single health care transaction can range from $25 to $100, with estimated total costs for claims paperwork in the United States estimated to be more than $250 billion per year. That's $250 billion that does not improve anyone's health. As a result, there is an enormous need and opportunity to address this inefficiency. By comparison, a bank's cost of a single transaction is less than a penny. It seems silly to compare the two given the differences in complexity. Remember when merchants manually ran credit cards through the imprint machine? Customers signed the slip and received a carbon copy receipt and the merchant summarized all of the charges and manually submitted them to the credit card company for payment. Today, customers swipe, sign electronically (for purchases over $50), and the merchant is paid instantly. Health care reimbursement could use some of that innovation. • Simplify: Because most of the documentation can be accessed from a central point, EHRs help to simplify the coding process. Of course, an EHR does not know what it does not have, so human intervention will continue to be required in order to ensure quality. 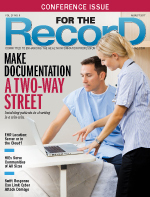 • Speed up: EHRs facilitate speed by centralizing records. Computer-assisted coding (CAC) can decrease process times, subject to human intervention. • Lower costs: EHRs and CAC technology should lower costs. In addition, costs can be lowered by seeking cheaper labor sources such as outsourcing overseas. With any option, quality must be maintained or it is false value. The bottom line is that in order to be successful in the coding business, owners must either reduce costs or add value. Simply providing labor to meet a client's coding needs is a low margin business as long as the services can be replaced with internal staff or the cheaper—or better—staff of another service provider. Without adding value, the traditional coding outsource model is essentially a commodity. Jason Martin, senior vice president of coding services at M*Modal, says new business can be obtained by focusing on coding quality and accurate reimbursement. Improved quality results in higher and faster reimbursement and fewer rejections. As data become more organized and transparent, an improvement in quality is both real and valuable. In short, even if a client's costs are not reduced, it's possible to increase the value of the services delivered. Melody Mulaik, president of Coding Strategies, a provider of consulting, training, and educational materials, says there has been an increasing opportunity for service providers to provide real-time independent coding reviews. On the surface, this may appear to the client to be an additional expense. In reality, however, the cost is outweighed by the savings earned through an increase in speed of collection and overall revenue. Service providers can also add value by teaching clients how to properly document and code. Physicians, nurses, technicians, and coders (domestic and foreign), as well as the software itself, all need to be adept in those skills. The better the documentation and coding, the more efficient and cheaper the process becomes. Analyzing data in order to improve clinical outcomes is another area where service providers can add value to their client relationships. There will always be a need for good coders. Despite continued industry rumblings that coders will be ditched in favor of CAC, there are no indications that will be occurring in the foreseeable future. CAC is a tool to help coders become more efficient, but it will not replace them. There was a time when coders had to work onsite at the hospital, review every paper file, and record every applicable code based on their findings. Traveling to the hospital and pulling files together for review does not add value—it's a cost. Today's coders can access files remotely over the internet. The EHR organizes documents into a central place where they can be easily retrieved. CAC is an extension of that efficiency. The technology can give coders a head start, but it lacks intuition and "does not know what it does not know." For example, coders can examine documentation and intuitively know whether something may be missing. They can request missing documentation to justify a different code that may either improve reimbursement or reduce the likelihood of it being rejected. CAC lacks that intuition; humans add that value. Furthermore, no matter how coding is performed, there always will be a need to improve quality and ensure compliance. Because there is an ongoing need to improve coding efficiencies, coders may consider a consulting career where they can advise others on the profession's finer points. An increase in overseas coders is likely to occur over the next several years, a trend similar to that in the medical transcription industry. However, coding as a whole will continue to grow and foster a need for qualified domestic coders for the foreseeable future. In short, health care needs reliable coding, a goal it can't reach without excellent coders. — John Suender is president of Suender M&A Advisors, a boutique merger and acquisition advisory firm focused almost exclusively in the revenue cycle management, coding, and transcription space.